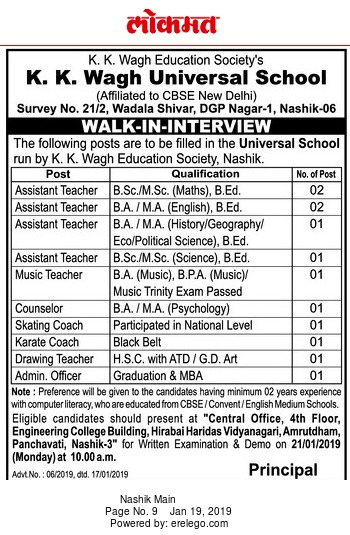 K.K.Wagh Universal School, Nashik has advertised in the LOKMAT newspaper for recruitment of Teachers / Assistant Teachers jobs vacancies. Interested and eligible job aspirants are requested to walk-in on 20th January 2019. Check out further more details below. 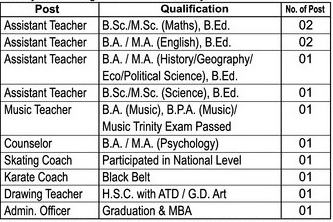 About School: K. K. Wagh Education Society is a leading educational trust in Nashik District. It was established in 1970 by the visionary leader Late Padmashree Karmaveer Kakasaheb Wagh. He realized the importance of education for upliftment of rural masses and started with a school in Niphad Tahasil. The education society later on received a land of 23 acres from the well-known Philanthropist, Late Ratansey Haridas Udesi (Kakuseth) of Hirabai Hansaraj Surji Charitable Trust, Nashik and was utilized by K. K. Wagh Education Society to establish an ideal Technical Campus.